Unfortunately I've got no big news or juicy gossip to excuse my absence. My sewing machine has been gathering dust save for a few projects here and there. Inspired by this rabbit costume I found on Etsy, I fell in love with the idea of a long sleeved bunny rabbit suit. I was browsing through some old issues of Ottobre to find a good starting point when I found the entire costume drafted for me in the form of a "piglet coverall" winter bunting, only I needed to replace the small pig ears with long bunny ears, and replace the curly tail with a white fluffball. I raided my stash and settled on some heavy grey wool jersey - the Vera Wang stuff from Fabric.com that everyone went crazy over two years ago. This fabric turned out to be much thicker than I expected, better for outerwear than a top or a dress. The floral cotton print is from a thrifted bed sheet (because don't all moms who sew and blog eventually use a thrifted bed sheet in their children's garments?). The legs and arms ended up being really long, but nothing some foldup action couldn't solve. I was even thinking that I could reuse the costume next year, or share it with someone else in need of a bunny costume, until I threw it in the warm wash with my other laundry and it felted into a small, stiff, sad little outfit. Good thing I only spent one night making it. 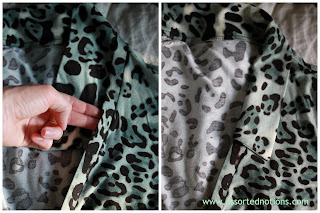 Sewing swimwear - it's not as hard as you think! I am waaaay behind in getting my projects onto this blog! In late June, we flew to the East Coast for a weeklong vacation in Nantucket, meeting quite a few members of Tim's family there. It was my first time there and I absolutely loved it! Not only because it was our first taste of Summer 2011, but the island is just so picturesque and lovely. If you love beach cottage style, Nantucket is your heaven. We rented bikes one afternoon and took L out for her first ride. She actually fell asleep during the ride! She did great during the whole trip, but naps? Fugetaboutit. So pretty much anytime we got in the car (or on a bike! ), she was out. I wanted some new swimwear for the trip. And I didn't want to spend hours in tiny dressing rooms with fluorescent lights trying on pieces that only half appealed to me. So I decided to try my hand at sewing swimwear. I figured the results couldn't be much worse than RTW. 1. 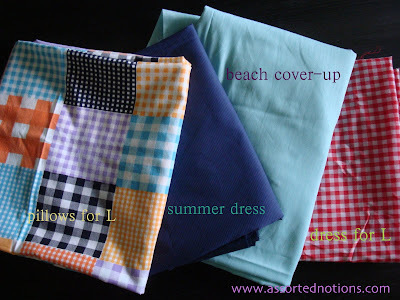 Lori's Sew Forth Now podcast, Episode 5: Dive into Swimsuits. In this episode, she interviews Anne St Clair on the ins and outs of sewing swimwear. I highly recommend a listen if you are planning to sew swimwear! She talks about needles, stitch types, elastic, fabric stretch - all the details of swimwear. 2. Threads Magazine #131, the June/July 2007 issue has an article "Inside Secrets of a Swimsuit" that provides info similar to the podcast, and of course the pictures are helpful. I made the McCall's 5400 tankini and the McCall's 3566 boyshorts. Milliskin Matte with 4-way stretch in Navy for the fashion fabric (it's a very nice, weighty material), and nylon lining (HSL-02) for the lining, both from Spandex House. The tankini is fully lined and the pattern instructions are very clear, this turned out to be an easier project than I anticipated and could certainly be made in one evening if one is determined to do so. 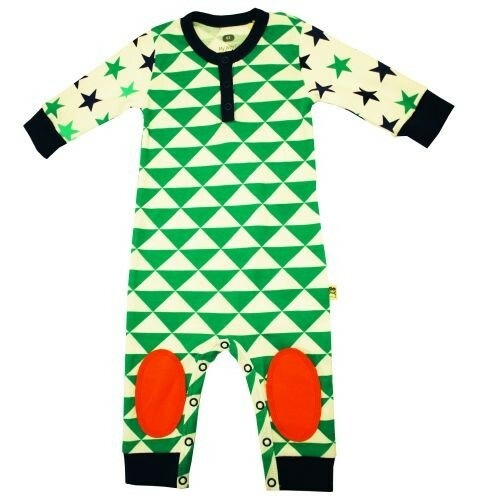 The front is made of two pieces with a horizontal seam just under the bust. You leave a slit in that seam at center front, then you put a tie through to cinch the center front together, creating a nice shape at the bust. There are separate pattern pieces for the upper front for A/B, C and D cup sizes. I went to my local fabric shop to find bra cups, but they only had sew-in cups, which I didn't want. The wonderful saleswoman there tipped me off that if you go to the swimwear section of a large department store, they will often have random, orphan bra cups that they're willing to give to you - free! So I dutifully headed downtown to Seattle's favorite department store, and sure enough I was allowed to dig through a box of homeless swim bra cups. I found quite a few matching pairs and took 2 sets. Now, if you sew this pattern as instructed, it won't accomodate removable bra cups, but it's easy to create a pocket for these. I cut a second lining piece for the upper front, but cut about an inch off at each side seam. 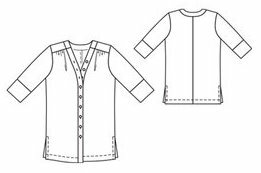 Layer this with the regular lining piece for the upper front, and be sure to leave the narrower lining piece's sides free when you are sewing the side seams. You'll end up with a pocket where you will be able to slip the bra cups in. The McCalls 3566 boyshorts were even easier to sew. Other reviews I've read of these boyshorts said that they run large, so I made a size 10 (I used a 12 in the tankini - and did quickie muslins of both to check the sizing). I took some height off the waistline and I took some length off the legs so they were more like a pair of RTW swim shorts that I like. The pattern instructions advise you to line just the crotch, but instead I created a full lining. Together, these pieces are somewhat reminiscent of a retro style suit. These simple styles were perfect for me to "dip my toes into" the world of sewing swimwear (pun intended). I have another pattern for a one-piece suit that I am hoping to tackle before a trip to Maui next month. If you have been considering sewing swimwear, give it a try! At worst, you'll lose a half yard of fabric and a few hours of your time. More likely, you will probably end up with a half decent swimsuit! Can you stand another post in which I mention breastfeeding? 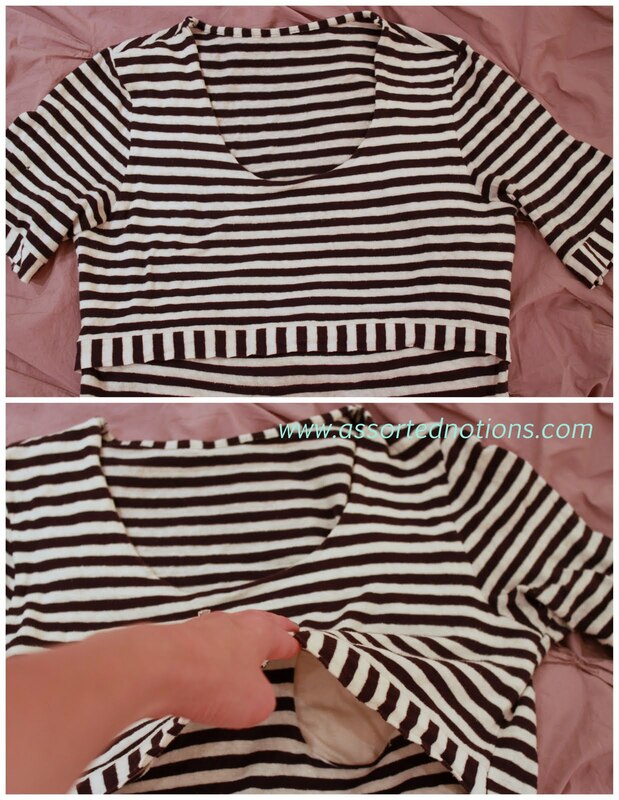 Since this week is World Breastfeeding Week, I thought it would be a perfect time to show you my absolute favorite (and one of the very few) nursing tops that I made, and how you can make your own! 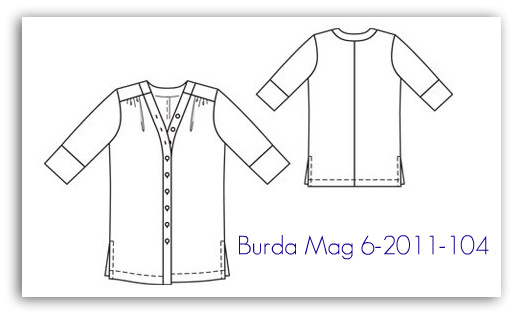 About a year ago, my local BurdaStyle Sewing Club had a sew-along in which we all used the BurdaStyle Lydia t-shirt pattern to sew a top for ourselves. It was great to see everyone's interpretations. I used the pattern as a starting point for a top based on a RTW nursing top that I saw online (and can no longer find to show you, unfortunately...). I didn't take any photos during construction so hopefully words will suffice. I know, a tutorial with no photos is no fun. Sorry. 1. Cut out the front, back, and sleeves as normal. I altered mine by cutting a deeper front neckline and by cutting the side seams a bit wider with more of an A-line shape, and I also added length. During those first few post-partum months, I avoided anything fitted in the waist! 2. Cut a second front bodice piece, but not the full length - this will be the shorter, top layer of the bodice. You'll want it to fall at least a few inches below your bra band. For now it's better to cut it too long than too short, you can check the length in a bit. I'll refer to this as the "short front" and the other front bodice as the "long front". 3. 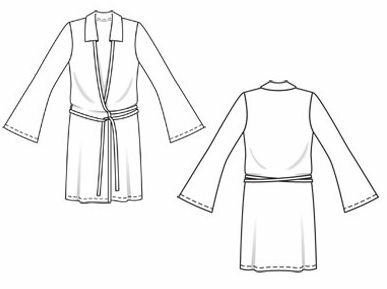 Stitch the 2 fronts together at the neckline, with the wrong side of the "long front" facing the right side of the "short front". Turn so that the "short front" is laying on top of the "long front". You should be looking at the right side of the fabric on both pieces. Baste together at the shoulders. 4. 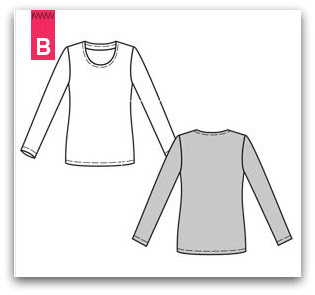 Finish the neckline of the back bodice with your preferred method. I used a strip of the fashion fabric to bind the back neck, you could also just press the raw edge to the inside and topstitch. 5. Stitch the front and back bodices together at the shoulder seams. Stabilize those shoulder seams with some interfacing, if you're so inclined. 6. Now is a good time to check the length of the "short front". Baste the side seams together (we're still sleeveless at this point) and put the top on. You'll want the "short front" to provide a bit of coverage below your bust, but the final length is up to you. Cut off length to shorten if necessary. 7. Hem the "short front" with your preferred method. I decided to play with the direction of the stripes of my fabric and hemmed it with a narrow band. Baste the "short front" and "long front" together at the side seams. 8. Stitch the sleeves to the bodice. I always set my sleeves in flat when I'm working with knits. 9. Stitch the sleeve seams and side seams. 10. Hem the sleeves and bodice, again however you prefer. I used vertical stripe bands to hem my sleeves in order to complement the bodice. 11. Now put the top on and mark both bust points on the "long front". Take off the top and cut a small circle around each bust point. Smaller is better at first, you can always cut a larger circle if necessary but you can't go the other way! Initially I tried cutting just a slit instead of a circle, but that didn't provide great access for me, so I ended up with circles. Voila! You are the proud owner of a stylish nursing top. I get a lot of compliments on this top. From people who don't know it's a nursing top. (I think it's the stripes, actually.) It's so simple yet one of my favorite pieces I've ever made. Leave a comment or shoot me an email if you have any questions about the construction! At long last, I finally got around to having Tim to snap some pictures of the June Burda top that I made. 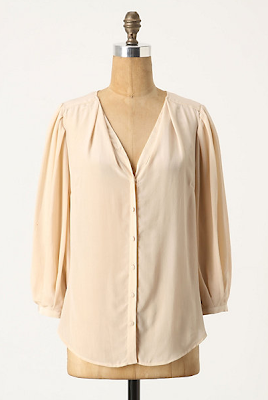 This is the kind of garment that I just luuurve. My office is pretty casual, I work at a computer most of the day, so I wear it just like this both to work and on my days off. I used a cotton chambray that I bought from the Britex remnant table during their 2009 Black Friday sale when I was with my sewing BFFs Cindy and Leslie. It's heavenly, like something you'd expect too see in a nice men's shirt. It's your standard woven shirt construction, nothing that'll surprise you. The front bodice has both a pleat and gathers where it meets the front yoke. The design is very similar to the Anthropologie Puckered Pocket Blouse, which has a pleat at the front yoke and also has pleated sleeves (and, interestingly, no pocket mentioned in the online description). You are supposed to cut 2 back pieces, stitch them together at the CB line and topstitch along that seam. This is a straight seam and I accidentally cut it on the fold. I thought the back might look too plain, so I cut a 1" strip of my fashion fabric, tucked the raw edges under and topstitched it along what would have been the CB seam. It's kinda straight. Kinda. I guess I should also mention that the top 2 buttons are on the v-neck and not intended to be buttoned, I just included one of those. Like I said, I love this shirt. Before I made this, I was all set to make the dress version too (style 105). Now I'm not so sure that'd I'd love it as a dress. We'll see. I have several other new pieces to share with you. Swimwear(!) 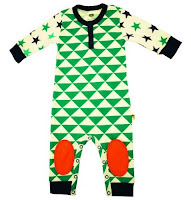 for me, and clothes for the kiddo. Stay tuned. You can now count me among the many who have made Vogue 1224, the Tracy Reese knit pullover dress that has won many hearts. It seems all seamstresses are pulling out their wild jersey prints for this one, and so did I.
I used a lightweight rayon/lycra jersey, originally purchased Summer 2010 at Pacific Fabrics, a local fabric store chain. One feature of this dress is an elastic waist that hits probably at the natural waist or higher on most people. I noticed that many other reviewers of this pattern lengthened the bodice and lengthened the skirt, but I decided to keep both as drafted. I'm just a bit short-waisted so this worked for me. When the weather's not exactly warm enough for a dress, I wear it as a tunic with pants. The pattern calls for the skirt to be lined. I used the same fashion fabric for the skirt lining and I deviated from the pattern instructions in that I assembled them as you would a bubble skirt - I'd much rather stitch one seam than two hems. Because the lining is shorter, you can't tell at all when I'm wearing it. I'm still breastfeeding so I continue to scrutinize garments as to whether they provide easy nursing access. 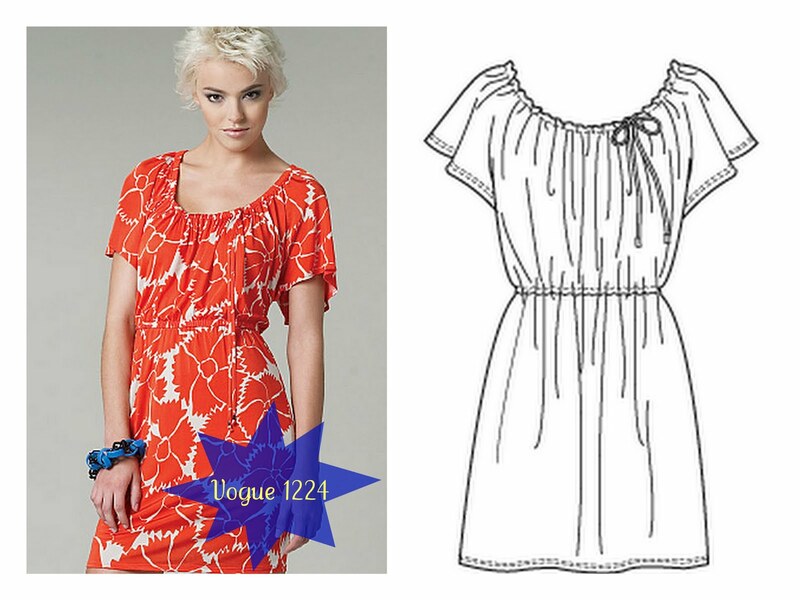 It turns out that Vogue 1224 is a stylish option for all the nursing mamas out there! The neckline drawstring is actually a length of elastic with a fashion fabric tie stitched to each end. The elastic is entirely hidden within the drawstring casing but it means the neckline has tremendous stretch (and recovery!). So, this pattern is a winner in my book. The last thing I need in my wardrobe right now is an animal print wrap dress, but I just couldn’t help myself! I’ve already traced 2 patterns from the June 2011 issue of Burda magazine, which was exciting after nearly a year of issues that didn’t thrill me. I am a sucker for a sewing pattern that has a designer’s name attached to it, and the Blumarine wrap dress in the latest issue of Burda was no exception. The dress is from the Spring/Summer 2011 collection, which is full of soft color and animal prints. I was even more excited once I realized that I already had the nearly perfect fabric for this dress (I am on a mission to sew up my stash - which is taking up precious real estate in a huge dresser in my daughter’s room (AKA my former sewing room – sigh…)). In 2009, I bought an animal print jersey during my vacay in Italy . 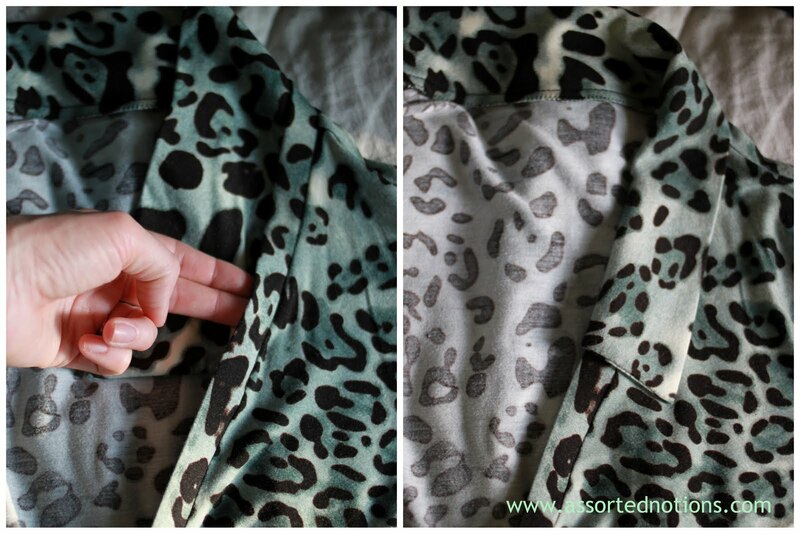 Bingo – animal print Italian fabric to go with the Italian label dress! Rayon/lycra jersey (I think) from Bassetti Tessuti in Rome, Italy. I made my pre-pregnancy size 38, but I could have probably benefitted from a 40 in the waist and the hips. Even though I'm back to my pre-baby weight on the scale, my measurements aren't there yet, a fact about which I'm still in denial. The line drawing and runway dresses appear much more loose and drapey in fit than my dress does. The Burda magazine instructions do not call for any interfacing at all in this dress, but I decided to apply interfacing to one side of the collar and one side of the front band. The jersey I used is super soft, so I used Sew Exciting's Pro-Sheer Elegance, it's a barely-there fusible interfacing and was perfect for this project. I also fused bias tape to the shoulder seams to prevent them from stretching out. If you decide to interface the collar, it's important to use something that leaves the collar very soft and malleable. The collar and the front band are both stitched to the bodice along the same stitching line, and the collar needs to be able to fold back over the front band. We had a babysitter booked for Saturday night, and I finished this just in time to be my date-night dress. The v-neck of my dress isn't as low as me as it appears in the runway garments (all a matter of how much you cinch the dress I think), but I still needed a U plunge bra in order to not have to worry about exposed undergarments. If I were to make this again, I would add some length to the skirt, since I personally think this would look best on me if it hit right at the knee. And, I would love to raid Tany 's jewelry box for the perfect bling to accessorize this!